← Today is the Day You Make That Commitment! Did you run today? That should be a very simple answer. Either you did or you didn’t. Sometimes when I ask that question I don’t get a yes or a no. I get excuses. “Well, I had to blah, blah, blah, and then by the time I was finished I ran out of time.” Really? 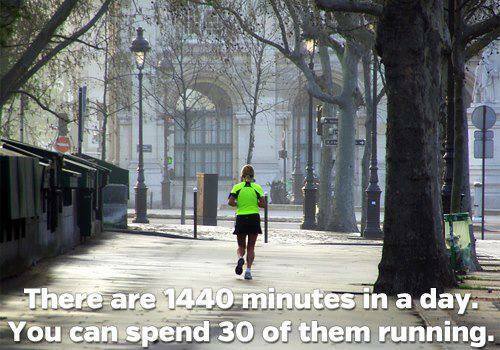 There are 1,440 minutes in a day and you couldn’t find 30 or so to run? How bad do you want to reach your goal? Honestly, I do understand some issues, I’m not a jerk. You cannot leave your small child alone at home while you run and the person who promised to watch your child didn’t show or something came up and they couldn’t. I know there are valid reasons to miss a workout. I’m not talking about those. We can make up for those because you really want to reach your goal. Either you ran today or you didn’t. It’s a yes/no question. When you hire a coach he or she cannot run for you. He or she cannot carve out time in your day to force you to run. We certified coaches learned how the human body works with running and conditioning, how to build a plan, and how to keep the risk of injury down so you reach your goal faster. Didn’t you hire a coach and pay good money so that you are held accountable for training? How bad do you want to reach your goal? I have trained runners who have listened to every word I say, do what I recommended, and who reach their goal fairly easily. You really do know nothing is easy but if you follow your coach’s plan and advice it will be much easier to reach your goal. How bad do you want it? Ask any one of the runners who followed my training if they reached their goal. Ask the ones who listened to me and did what I asked them to do, how many days to run, how many miles to run, what pace to run. 100% succeeded. Ask the ones who did not follow my plan. 0% succeeded. Read the testimonials. You didn’t have a goal? Then you didn’t train with me. It’s time to train correctly. I can help you reach your goal and it is worth every penny, I guarantee it. I even run with you sometimes if you live within a not so far drive away. You don’t know what you’re missing, including my great sense of humor (OK better ask a few people on that one). I can promise you that I am accurate when I say I can get you to your goal or goals if you are honest with me, communicate honestly, and listen to my plan and advice. Contact me at runyourbestrace@gmail.com to get started soon! No excuses!